Alfred R. Taylor lives with his wife and two children outside of Orlando, Florida. He is a graduate of the creative writing program at the University of Central Florida where he graduated with a Master’s in English. He manages to find time to write when he is not too busy raising a family, working on the house, or paying his mortgage. He is presently working on his next novel titled Full Circle: Covert Invasion. Full Circle: Time’s Warden is a work of science fiction by author Alfred Taylor. The central concept of the novel follows the idea of modern day and futuristic thinkers using time travel to return to key points in American history and bring about certain conclusions without destroying the course of history itself. Mark Aaron, a former historical researcher for Nora Corporation, visits the past again with his Gamma-class android companion, Jane. In this installment of Full Circle, the pair visit the American Civil War where another android is attempting to intensify the speed of the victory for the South, and the heroes face some hard truths about modern beliefs and what must be done in order to preserve the past. I really enjoy combinations of science fiction with historical fiction, and the central time travel concept of Full Circle allowed for a really readable and exciting premise to the novel, following through into a plot that is very difficult to predict. Though the issue of racial tension and slavery was an obvious pressure point from the start, the journey that Mark goes on with the issue was sincere, difficult and heartfelt, presenting an unusual level of emotional depth for this genre of story. Alfred Taylor has a strong commitment and knowledge of American history, but it’s his concept of humanity and human nature which really shone for me. Overall, I’d definitely recommend Full Circle: Time’s Warden as an intriguing and action-packed tale which also raises important questions about human history and the path of war and civil rights. I think Full Circle is a great name for a series about time travel. I like that title and I think I’m going to love this series. I just finished reading Time’s Warden by Alfred R. Taylor. It is not the first book in the Full Circle series. Having determined that these events are probably important to the series, I still don’t think it will take away from your reading pleasure if you read this series out of order. Halfway through chapter one, it was obvious that something big had happened to Mark and Jane not so long ago. But there was no way that I would stop reading. I was already hooked on this book. Time’s Warden by Alfred R. Taylor is so fast paced and well written that, once you start it, you won’t be able to put it down. The writing is great and really moves the story along, but for me, it was the characters that made the story interesting. The banter and subtle emotional back and forth between Mark and Jane are priceless. Part of the joy of reading Time’s Warden is finding out just how human Mark and Jane are. They are faced with a lot of important decisions and sometimes it would be better for their mission to be indifferent or even cruel. They both reject that approach and always find a solution that is humane and practical. I really like them both and it is satisfying that they like each other. Even Abraham Lincoln liked them, and his opinion is one you can trust. The second book in the Full Circle series, Time's Warden sends hero Mark Aaron, a historical researcher for Nora Corporation, and his companion Jane, a Gamma class android, on another odyssey through time, space and history. 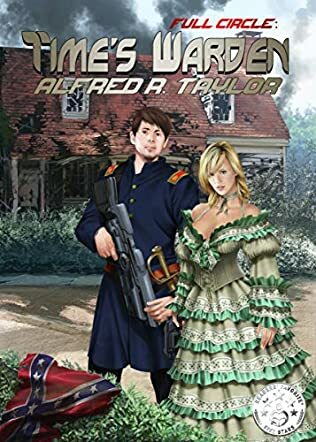 This time, he faces his most dangerous adversary: Three, a fellow android from the future, whose goal is to change the course of the American Civil War to give victory to the South. Mark and Jane must use all of their resources, and become something they abhor, in order to preserve the Union and save humanity from ultimate destruction. It takes a special kind of talent to write a novel that intermixes high technology and historical facts to weave a fascinating science fiction adventure loaded with verisimilitude; Alfred Taylor possesses that talent in spades. Full Circle: Time's Warden, though the second book in the series, is easily read and thoroughly enjoyed as stand-alone. Taylor does an excellent job in providing back story information without long explanatory passages that slow down a story. In fact, there are no sluggish passages here. Through dialog and action, the characters, both protagonist and antagonist, are clearly running the show. Exceptional attention to detail that comes from extensive research and imagination brings 24th century technology to 19th century America in a fascinating and action-packed story. This is highly recommended for readers of all ages. If you're a fan of science fiction, alternative history, romance or action/adventure thrillers, Time's Warden, along with the first and next books in this series, are must-reads.